Metal-matrix self-lubricating composites can exhibit excellent tribological properties owing to the release of solid lubricant from the matrix and the formation of a lubricating film on the tribosurface. The coverage of the lubricating film on a worn surface significantly influences the sliding process. However, it is difficult to quantify the film coverage owing to the thin and discontinuous character of the lubricating film and the high roughness of the worn surface. A quantitative characterization of the lubricating film coverage based on X-ray photoelectron spectroscopy (XPS) analysis was developed in this study. The friction tests of Cu-MoS2 composites with a MoS2 content of 0–40 vol% were conducted, and the worn surfaces of the composites were observed and analyzed. Further, the influence of the MoS2 volume content on the coverage of the lubricating film on the worn surface was investigated. The relationships among the volume fraction of the lubricant, coverage of the lubricating film, and the friction coefficient were established. 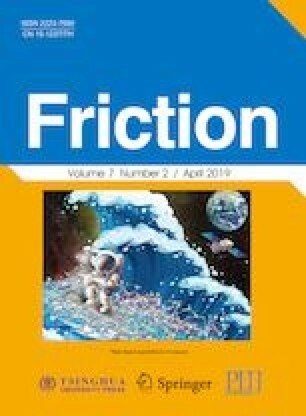 The friction model for the metal matrix self-lubricating composites was developed and verified to facilitate the composition design and friction coefficient prediction of self-lubricating composites. Jinkun XIAO. Assistant professor, obtained his bachelor degree and Ph.D degree in 2010 and 2015 from Central South University, majoring in material science and engineering. He worked as an assistant professor since 2015 at Yangzhou University. His interested research areas include self-lubricating composites, metal matrix friction materials, wear-resistant coatings, powder metallurgy and thermal spray technology. He has published more than 20 papers on international journals. He presided and participated in many research projects like “National Natural Science Foundation of China”, “Natural Science Foundation of Jiangsu Province”, and some cooperation projects. Yuqing WU. She received her bachelor degree in material processing and control engineering in 2017 from Yangzhou University. After then, she was a master student in material processing engineering at the same university. Her interested research areas include wear-resistant coatings, high-entropy alloy and thermal spray technology. Wei ZHANG. He received his bachelor degree in metallic materials engineering in 2015 from Nanchang Hangkong University. He is currently pursuing his master degree at Yangzhou University. His interested research areas include metal matrix self-lubricating composites and thermal spray technology. Juan CHEN. Assistant professor, obtained her bachelor degree in 2010 from Xi’an Polytechnic University and Ph.D degree in 2016 from Central South University, majoring in material science and engineering. She worked as an assistant professor, since 2017 at Yangzhou University. Her interested research areas include wear-resistant alloys, superalloys, thermodynamic, kinetic, microstructure, scanning electron microscope and transmission electron microscope. She presided and participated in many research projects like “National Natural Science Foundation of China” and “China Postdoctoral Science Foundation”. She has published more than 10 papers on international journals. Chao ZHANG. Professor, obtained his bachelor degree from Chongqing University in 2003 and his Ph.D degree from Technology University of Belfort-Montbéliard and Xi’an-Jiaotong University in June 2008. From September 2007 to January 2009, he worked as a teaching-research assistant in Technology University of Belfort-Montbéliard. Since February 2009, he is a postdoctoral researcher, and then a senior researcher in materials science Department of Engineering School of University of Mons. In 2014, he joined Yangzhou University as professor where he is leading a research group on thermal spray coatings and gas sensors. His research interests include thermal sprayed techniques and coatings, especially gas sensing and wear-resistant coatings. He has published more than 70 papers on international journals. The authors would like to thank the National Natural Science Foundation of China (Grant No. 51804272), Natural Science Foundation of Jiangsu Province (Grant No. BK20160472), Natural Science Foundation of the Jiangsu Higher Education Institutions of China (Grant No. 17KJB460017), Project funded by China Postdoctoral Science Foundation (Grant No. 2018M640526), Jiangsu Planned Projects for Postdoctoral Research Funds (Grant No. 1601095C and 2018K073C), Postgraduate Research & Practice Innovation Program of Jiangsu Province (Grant No. SJCX17_0623), Marine Science and Technology Project of Jiangsu Province (Grant No. HY2017-10), Cooperation Funding of Yangzhou City-Yangzhou University (Grant No. YZU201722), and Jiangdu Advanced Equipment Engineering Institute of Yangzhou University (Grant No. 2017-01) for the financial support provided.